Traditional Wing Chun Kung Fu is a self defence system like no other. Wing Chun is a martial art based around human biomechanics and science. Wing Chun is the only martial art which fights on the blind side, incorporating proven scientifically principles and concepts. All other martial arts fight head on and therefore the bigger, stronger fighter must win. Wing Chun’s approach is unlike other “styles” and hence why it is referred to as a “self defence system”. Multiple opponent self defence, weapons defence and environmental awareness, are other components to the combat side of the Wing Chun System. 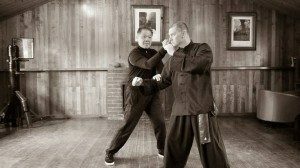 The Wing Chun System has a holistic approach to self defence utilising not only science and biomechanics, but also utilising Traditional methods such as the psychological and spiritual components including Traditional Chinese Meditation, Chi Gung, Chinese medicine, meridian therapy and other proven Traditional Chinese methods. These methods are usually only found taught to professionals who train in combat, we teach these methods to people just like you. With violence becoming more prevalent self defence skills are an essential part of your personal and perhaps professional life. Traditional Wing Chun is perfect for women, children and men. Our program and training is specialised and Sifu Leigh has experience in real violent situations, understanding how nasty and crazy people can be in violent situations including not only street but domestic violence situations as well. These situations are not only effect women, but men and children as well. and many other fields where your employment requires you to travel and converse with people. Our self defence classes are fun, exciting, challenging and realistic. There is much more to self defence than just punches and kicks, this is just the beginning. We also offer one on one or group private tuition as well as corporate training and any other group bookings. We train self defence skills to high end security, military and para-military organisations as well as small groups and individuals who just require skills to keep them safe. 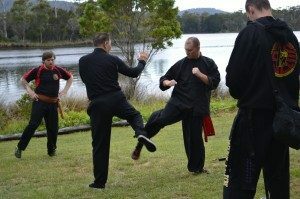 Call us now for information regarding our self defence classes in Hobart, Kingston, Launceston or about making one of our other specialist bookings.